NOTE: Available for clients using our cPanel packages: SoHo/Business/Mocha + all WP packages. The Remote MX Wizard in cPanel enables you to quickly and easily configure your domain to work with Google Apps. The Remote MX Wizard configures your domain's DNS mail exchanger (MX) records to use Google's mail servers. After this occurs, you cannot use cPanel to manage your domain's e-mail accounts. Instead, you must manage the domain's e-mail accounts through Google Apps. 1. Log in to the cPanel account for the domain. 2. In the Mail section of the cPanel home screen, click Remote MX Wizard. 3. On the Step 1 of 3 page, in the Select Domain list box, select your domain. 4. On the Step 2 of 3 page, under Additional Services, select the check boxes for the Google Apps services that you want to configure for the domain. 5. Click Continue & Configure the domain with Google Apps. 6. Click OK to confirm. 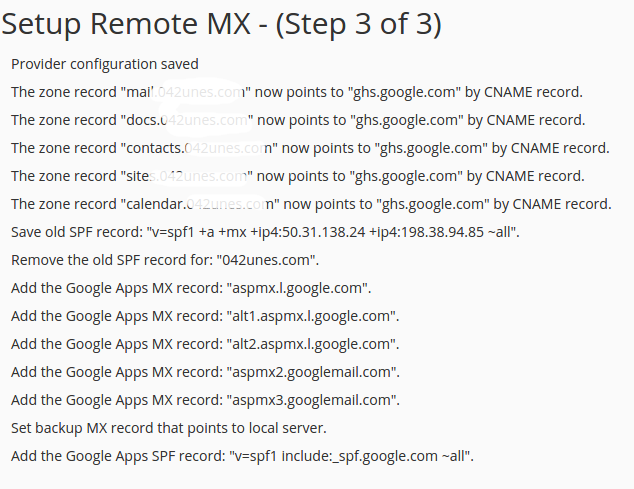 The Remote MX Wizard configures the domain to use Google Apps. 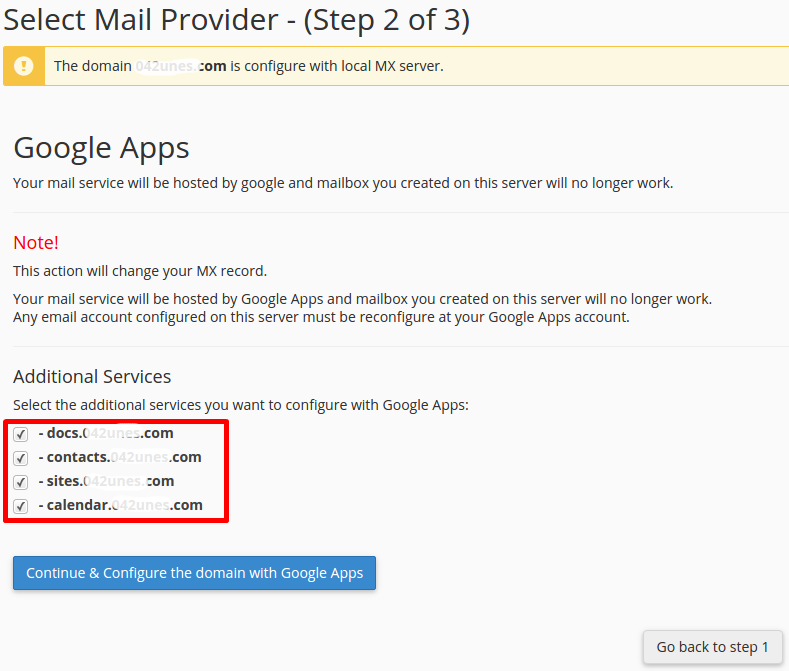 If you have previously configured a domain to work with Google Apps, you can use the Remote MX Wizard to remove it. The Remote MX Wizard configures your domain's mail settings by modifying the DNS mail exchanger (MX) records. After this occurs, your e-mail is no longer managed by Google's mail servers. Instead, you must use cPanel to manage your domain's e-mail accounts. 2. In the Mail section of the cPanel home screen, click Google Apps Wizard. 3. On the Step 1 of 3 page, in the Select Domain list box, select the domain you want to remove from Google Apps. 4. On the Step 2 of 3 page, click Continue & Remove the domain from Google Apps. 5. Click OK to confirm. The Remote MX Wizard removes the domain from Google Apps.